As soon as I saw this weeks challenge I knew which photograph I was going to use. Here’s the background. Our stretch of the coast has beautiful flat sandy beaches with sand dunes behind On the 26 February 1990, a combination of high tides and extreme weather broke through the sea defences causing flooding, resulting in about 2,000 people being evacuated from their homes and businesses. Along our part of the coast the sea defences have been improved since then, just as well because strong northerly winds drive the waves inshore really fast. Those waves break against the rocks and concrete walls of the new sea defences, throwing plumes of spray high into the air, which makes for great photography when the tides in. And that’s where I was on a sunny but very windy day when I heard the “skirl o’ the pipes”. The Scotsman in me just couldn’t ignore it, a slow lament carrying on the wind, I just had to investigate. But where was it coming from? I thought I was the only mad person out there, that is apart from the arm-chair drivers who park on the seafront and never get out of their cars. Now the sound of the pipes can easily travel 2 to 3 miles if the wind is in the right direction. Our seafront is about four miles long but I thought I could vaguely make out the shape of someone walking along the furthest point of the sea wall about a mile from me. The sound was coming from that direction so off I set to investigate. I’m glad I did. Each year the gentleman pictured here comes to Prestatyn, to play his pipes. In fact it’s nearly the anniversary of his last visit so I’m hoping to get down on the seafront to see if he’s there. Next Post It’s quiet here…. That must have been a hauntingly beautiful experience – I can see why it would stay with you. I wonder what his story is. I love it. 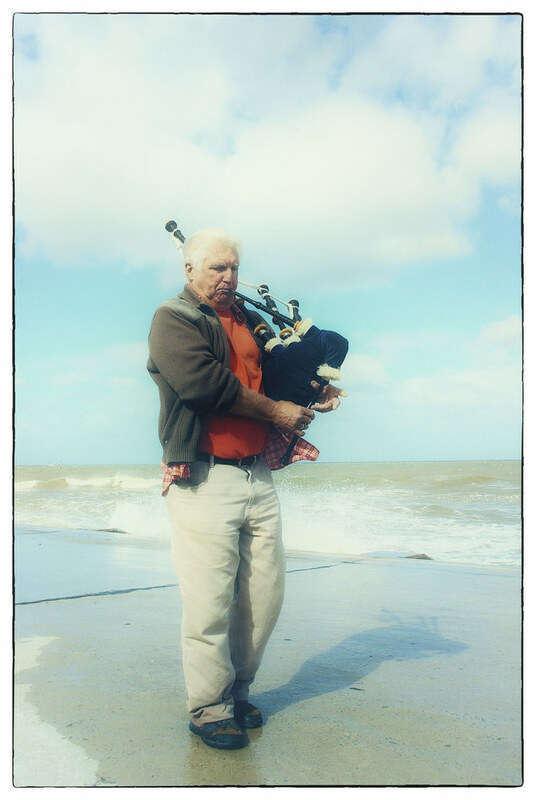 I have so many memories of pipers through out my life… I always love to hear them! love it. thanks for this free spirit!